Last Monday, the EPA proposed a landmark rule to limit carbon emissions from existing power plants, which we covered in a complete breakdown. Specifically, the rule calls for a nationwide reduction on carbon dioxide emissions from the power sector by 2030 that will be 30% lower than 2005. The EPA estimates this will lead to net global climate and health benefits of $48 billion to $82 billion. The EPA set each state’s 2030 goal using a standard formula and specific data about that state’s individual average CO2 emissions rate and the amount of electricity produced. This pollution-to-power ratio is called “carbon intensity”. No two states have the same carbon intensity or the same reduction goals. For Connecticut, we’re looking at a carbon intensity reduction of just under 30% by 2030. State Goals proposed by the EPA. 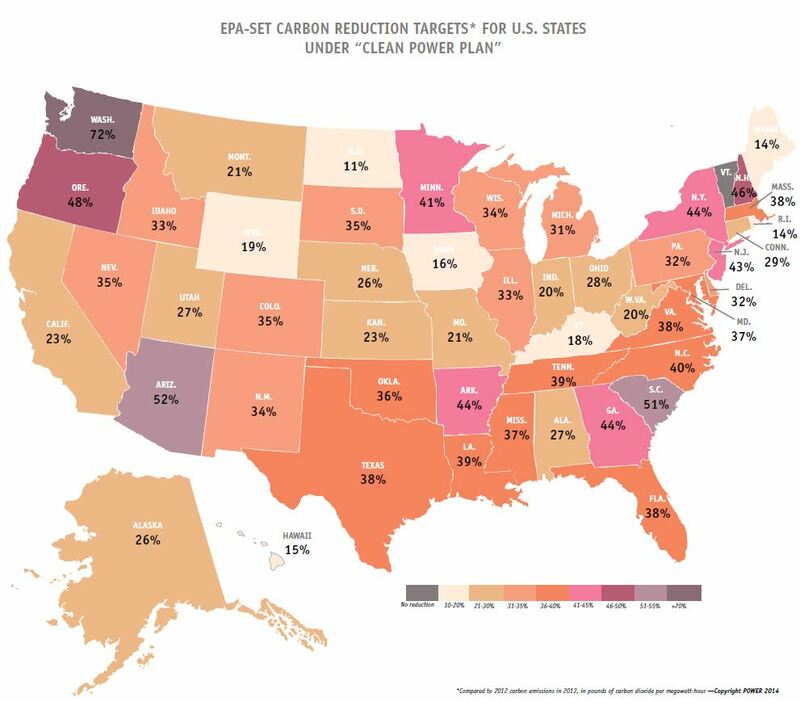 Map Credit: Power Magazine In a range between North Dakota at 10% and Washington at 70%, Connecticut needs 30%. A process to report on progress in achieving emissions reductions every 2 years. While each state plan must have these basic elements, the EPA gives states flexibility in implementing the carbon reductions policies that make sense for them. State plans can include direct plant upgrades to carbon-intensive power plants, but can also include programs that promote development of renewable energy sources and increase demand-side energy efficiency. The good news for Connecticut is that we have already implemented many greenhouse gas reductions policies that will set a strong path toward meeting the EPA’s carbon emission reduction goal for us. Our renewable energy investments through the Clean Energy Finance and Investment Authority (aka “The Green Bank”), participation in the Regional Greenhouse Gas Initiative (RGGI), and demand-side reductions through our energy efficiency fund can be included in our state plan. Last Friday, the Connecticut Department of Energy and Environmental Protection issued a status report on our progress in meeting state climate goals set by our Global Warming Solutions Act of 2008. The report shows that we are well on our way toward meeting our goal of 10% greenhouse gas emission reduction below 1990 levels by 2020. However, the report did little to address the long term state climate goal of 80% greenhouse gas emission reduction below 2001 levels by 2050. The state plan under the proposed EPA rule would require Connecticut to delve deeper than the recent DEEP climate status report. Under the proposed EPA rule, Connecticut will be required to track the emission reductions that result from our specific policies, such as RGGI and the Green Bank, and prove their effectiveness. Taking this hard look at the policies we have implemented will get us on track for meeting the EPA’s 2030 goal as well as our longer term 2050 state goal. Posted by Lauren Savidge, Staff Attorney/Climate & Energy Specialist, and Tyler Archer, Outreach & Development Associate.